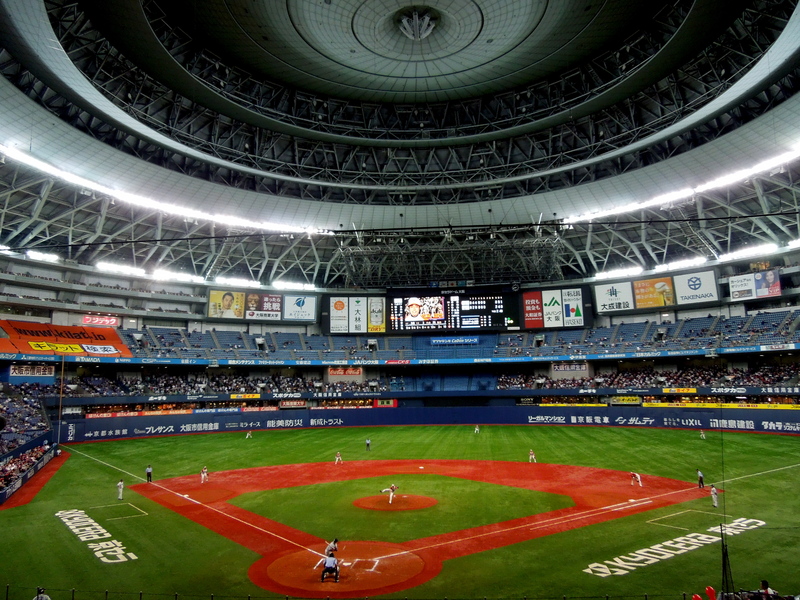 As this was my first time traveling to Osaka, I was a little anxious/nervous about getting to the Kyocera Dome where the Orix Buffaloes play. So I gave myself plenty of time to get there. As it turned out, I only had to make one train transfer, and the the total travel time from Awaji was around an hour and a half. In order to watch batting practice, I arrived at the ballpark about two and a half hours before first pitch. I was able to use the little Japanese that I know to buy my ticket, and from there I proceeded to wait in a neatly formed single file line outside my designated gate. Yes, I said single file line. This was a shock to me, as I am used to Fenway park in Boston where it can be an unorganized crowd of people surrounding the gate. But this is Japan, where everything is orderly. 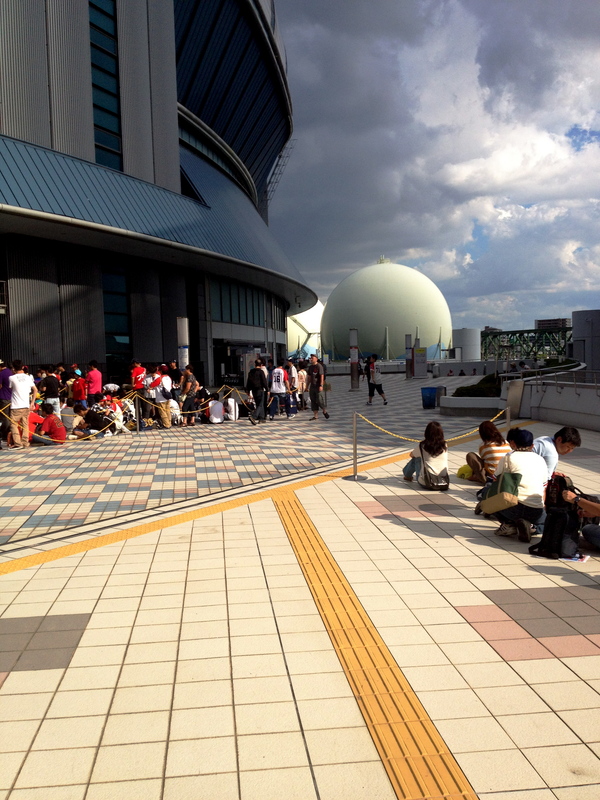 Fans sitting on the ground in line outside their designated gate. The way people wait outside the stadium was the first major difference I noticed. The second one came during batting practice. As I was taking photos from the right-field bleachers, a ball was hammered towards me. Naturally I raced up a couple of stairs and tried to catch it, while holding my camera in my other hand. I jumped up and reached back over my head only to have the ball bounce out of my hand. Luckily it deflected back towards me, and I was easily able to pick it up for my first souvenir . Within ten seconds an attendant rushed up to me, rambled off something in Japanese, and put his hand out to take the ball. It turns out, unlike in America, you are not allowed to keep any practice balls. I was crushed. But I was still in paradise as I was able to secure my seat and take in the rest of batting practice. Inflatable bats, fans, and programs reserved the outfield bleachers. In terms of securing your seat, you should make sure that it’s the first thing you do if you buy a bleacher ticket. Upon entering, fans immediately lay all sorts of Buffalo memorabilia over there desired section of the bleacher benches, and leave it there. Amazingly it goes untouched. From inflatable mini bats, to towels, to programs, you see it all dispersed across the outfield benches. The game itself was super slow and a little boring. But that did not stop the Buffalo (Ichiro’s former team) fans or the visiting Seibu Lion (Daisuke Matsuzaka’s former team) fans from cheering on their respected teams. Even after three hours in an 8-2 game, which was only in the seventh inning, fans continued to cheer loud. I admire their dedication. Especially since when I watch the Red Sox on TV, I normally change the channel in disgust after they make mistakes; I guess I wouldn’t make a good Buffaloes fan. The highlight of the night was the 7th inning balloon release. Going into the bottom of the inning, I strolled out towards the right-field bleachers to be apart of the Buffaloes cheering section, which consisted of one director stationed on a podium, a few trumpet players, one drummer, and a mass of faithful Buffalo fans. before I knew it, thousands of flying red balloons were whistling their way through the stadium. 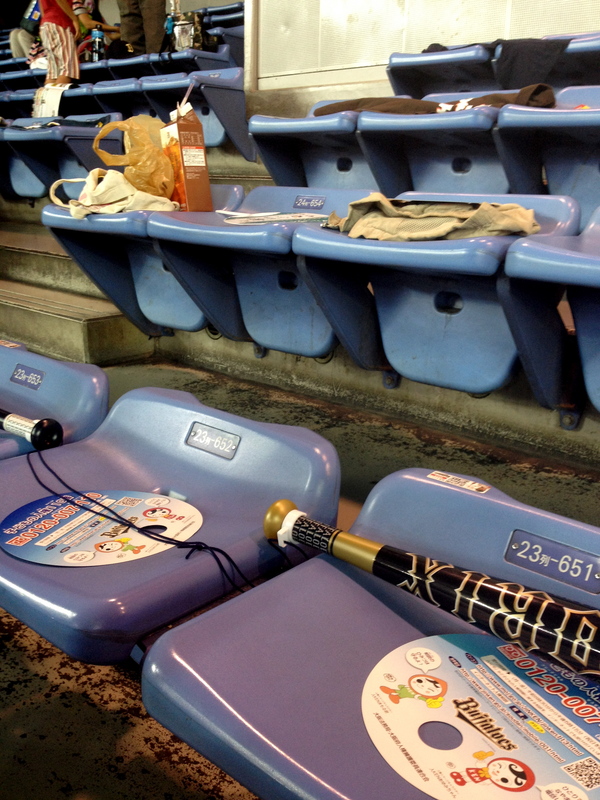 This was Japan’s version of America’s seventh inning stretch…I think they win for creativity. Once the balloons deflated, I made my way to the exit. I can’t remember the last time I left a game early, but after five and a half hours, I was getting hungry and wanted to check out some restaurants around the stadium. Overall, it was a thrill to take part in my first Japanese baseball game. I was able to witness first hand the amount of dedication fans have for their team. And I even learned a few lesson about Japanese culture, like returning batting practice home run balls. 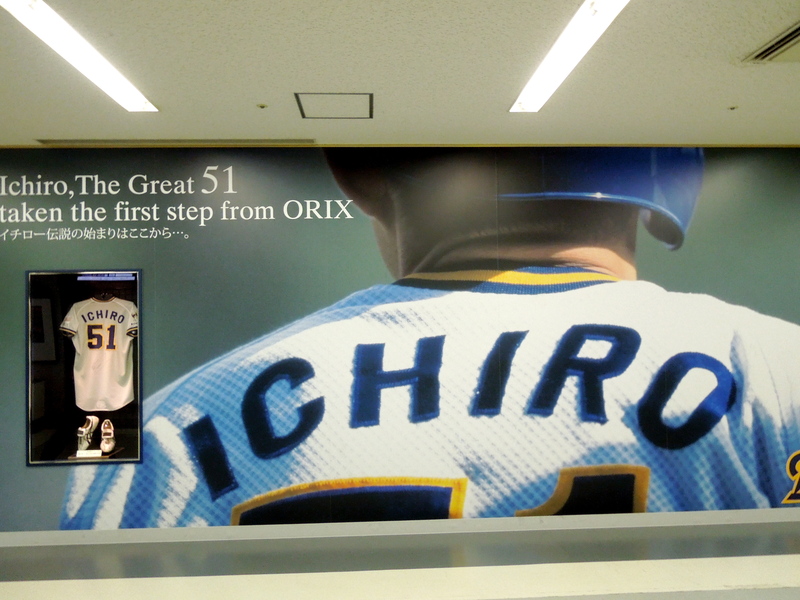 This entry was posted in Baseball, Culture, Traveling in Japan and tagged balloon release, Baseball, Japanese baseball, Orix Buffaloes, Osaka, Osaka Dome, Seibu Lions. Bookmark the permalink. Gosh! I was soooo surprised too when I went to see a game in Fukuoka (my first) and there was NO crowding getting in……or at any other time during the game!! It was nice! Thanks, angrygaijin. The lack of crowds was refreshing! In Japan, there are no distractions and it’s all about the baseball. Eijongo, thanks for checking out the blog!